We are a grief support group. NOTE: This is a demo. 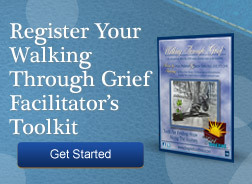 Registered grief support groups will have access to a fully functioning page. There have been no recent posts. No artwork has been submitted yet. No biographies have been submitted yet. Below you will find all of the professional handouts that accompany the nine-disc facilitator's toolkit.